I am sure 97-99% have seen The Wizard of Oz at some point in our lives. It is an essential classic that will stand the test of time. Oz: The Great and Powerful, however, isn't exactly one for the ages. But, whether it is a prequel or a stand-alone film, it is still a feast for the eyes of imagination. Oz: The Great and Powerful follows the story of a magician/conman named Oscar aka "Oz" (James Franco) who, while flying a hot air balloon, is caught up in a tornado and transported to the land of Oz. There is where he meets three witches: Evanora (Rachel Weisz), Theodora (Mila Kunis), and Glinda (Michelle Williams), who wonder if he will be the one to fulfill a prophecy to lead the land of Oz. Now, Oz must decide where his loyalties lie while demonstrating his own special form of wizardry. First off, I loved the visuals of the film. Some of the creatures looked pretty cool, including the Flying Monkeys, who I actually thought were pretty terrifying. Plus, the set designs were quite spectacular. In particular, Emerald City was quite a "gem" to look at. I also really liked the film's climax. It was neat how Oz was able to use a different kind of weapon to try and defeat the antagonists with the use of his intellect. I thought that was very nice. Another thing I liked was some of the actors. James Franco was quite good as Oz, even though I personally didn't think the character itself was strongly written. But i'll get to that in the "downs" section. Rachel Weisz looked like she was having a ball playing Evanora as she plays the role with such feisty flare. In my opinion, she was the real scene-stealer. Michelle Williams brings her own special flare to the role of Glinda as she plays the character rather strongly and not just bubbly like how Glinda was in the original film. Zach Braff, who plays Finlay, added quite a bit of comic relief and I loved the scenes of banter between him and Franco. Now, one of my biggest complaints has to be the character of Theodora. She goes from being one of the more nicer characters in the film to (*spoiler alert*) the Wicked Witch so hastily that when it does happen, you just don't care. It honestly seems a little unneeded to make Theodora the Wicked Witch when her sister Evanora is already pretty wicked and dresses in green. If they wanted Theodora to undergo an arc, then that's fine, but I would've preferred if they just had her go from sunny to rainy without undergoing a physical transformation. Also, while I do like Mila Kunis, I thought she was quite miscast in the role. Whenever she would try to be threatening, all I could hear was Meg Griffin. She was a great Theodora, but just didn't work as the Wicked Witch, in my opinion. Since I mentioned how the character of Oz was poorly written, I thought he was poorly written because he says how he wants to be a better man yet he keeps retaining his rather charming yet deceitful persona. James Franco does the best with what he's given, though, and I credit him for that. I also thought the story was quite cliched. The whole thing about the main character fulfilling a prophecy, as well as a jerk trying to change his ways and such has already been done before. 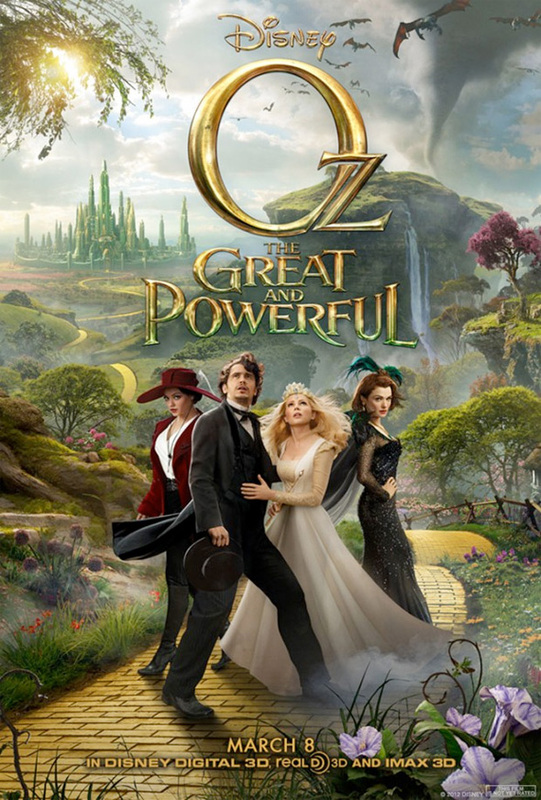 Overall, Oz: The Great and Powerful is a beautiful-looking fantasy that has a few ugly cracks down the Yellow Brick Road. It has stunning visuals and set pieces, but ultimately suffers from problematic storytelling and character development. There are some great performances to be found that even save the film from getting such a low rating. I would say if you haven't seen the original Wizard of Oz yet, watch that before you give this a watch. That one is a true classic. This one may not be one for the ages, but it is far from a waste of 2 hours.